People at Mercedes surely know how to tantalize their fans. 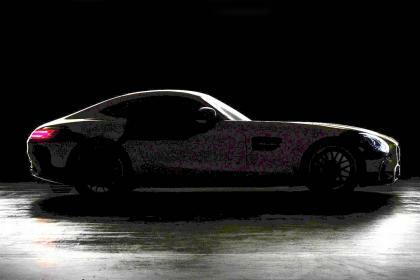 After unveiling an official sketch of the AMG GT, recently in New York Motor Show, Mercedes-Benz has come up with yet another teaser. 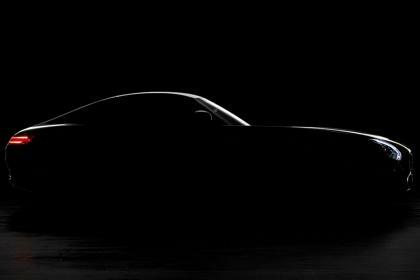 Images showing silhouette of the AMG GT with just the tail lights illuminated is an add on to the enthusiasm of petrolheads. With a curved boot lid, sloping rear and a long bonnet the car gets its sporty appeal. The car would be competing with 911, Jaguar F-type and other such cars in this particular segment. GT would get a Mercedes-Benz’s trademark front end with wraparound tail lights as seen in the image above. The company claims that GT would be replacing SLS and the styling of the car would be similar to that of the S63 AMG Coupe. If the above image is brightened( as shown in the image below), the air vents and the alloy wheels design can be easily seen. The side panels will have a different shape with the Mercedes bulging flanks. The interiors would get a two tone leather upholstery, Hugging sports seats and a center console simulating the look of a parallel cylinder V8 engine. Chrome elements will we visible on the AC vents and on the center console too. 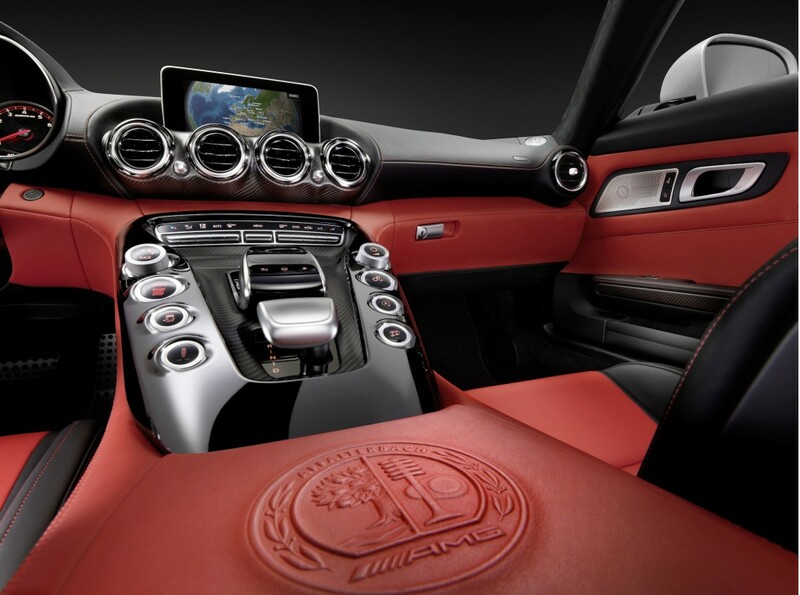 In the image below it can be seen that an earlier version of the AMG emblem has been embossed on the leather upholstery. While developing the AMG GT the engineers has to consider the driving dynamics, agility and sportiness of the car to be at the acme. Although nothing is official as yet, the car is rumored to be powered by a newly developed 4.0 liter, V8 win-turbo engine. This engine will give out 475 bhp of maximum power. It is quiet possible that the car would have a 9-speed transmission which is recently developed by Mercedes-Benz. However all these specs cannot be confirmed until the car is officially launches later this year. 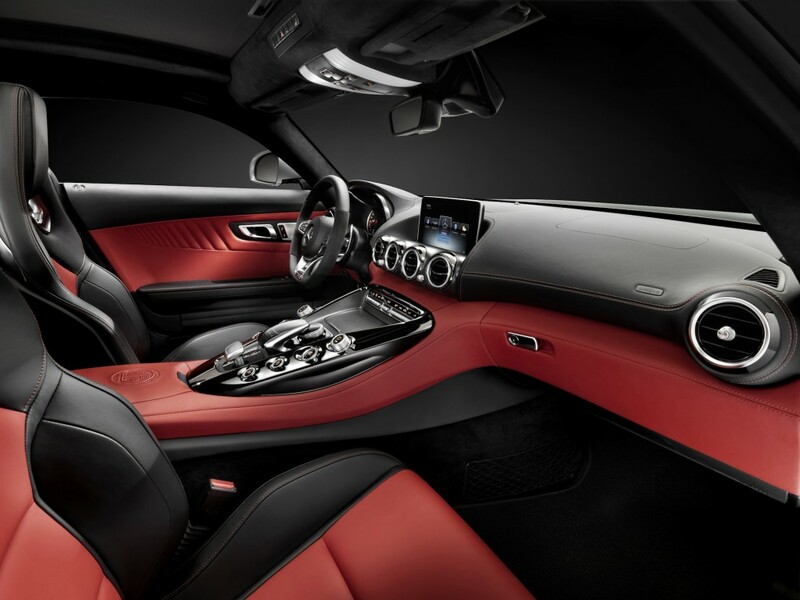 Mercedes-Benz AMG GT will rival Porsche’s 911, Jaguar’s F-Type and Lexus RC-F.